The MD88 is designed for industrial control applications that require solenoid drivers and protected high-voltage inputs. There are 35 high-voltage I/O lines routed to screw terminals and headers, including 7 inputs, 14 outputs, and 14 hardware-configurable inputs or outputs. The inputs can take up to 35V DC. The outputs are capable of sinking 350 mA at 50V per line, and they can directly drive solenoids, relays, or lights. Starting at $74 (qty 100). The MD88 is based on the A-Core with compatible software drivers and C/C++ Evaluation or Development Kits. It offers many of the same features the original AC does with slightly increased physical dimensions. The MD88 can be integrated into an OEM product as a processor core component. By building your product around the MD88, you reduce the time from design to market introduction, cut development costs, minimize technical risks, and deliver a more reliable product. 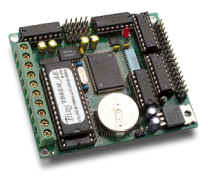 Measuring 3.1 x 2.6 x 0.3 inches, the MD88 offers a complete C/C++ programmable computer system with 35 protected high voltage I/Os, and a 16-bit high performance CPU (Am188ES, AMD) operates at 40 MHz system clock with zero-wait-state. It features up to 512K EPROM/Flash, 512K battery-backed SRAM and 512 bytes serial EEPROM. Two high speed DMA driven serial ports from Am188ES support high speed reliable serial communication up to 115,200 baud supporting 8-bit and 9-bit RS-232 communication with on-board RS-232 drivers. There are three 16-bit programmable timers/counters and a watchdog timer. Two timers can be used to count or time external events, up to 10 MHz, or to generate non-repetitive or variable-duty-cycle waveforms as PWM outputs. The Pulse Width Demodulation (PWD), a distinctive feature, can be used to measure the width of a signal in both its high and low phases. It can be used in many applications , such as bar-code reading. A real-time clock (RTC72421, EPSON) provides information on the year, month, date, hour, minute, second, 1/64 second, and an VOFF control signal. A supervisor chip with power failure detection, watchdog timer, a LED, 5V linear regulators, screw terminals, and pin headers are on board.